Your could use Tile Layer, as in the attached example. You could render the image onto the inside of a cylinder (Make Tube), then place a camera (Make Fisheye Camera) inside the cylinder. Or maybe somebody's made a PBMesh file that maps from cylinder to fisheye, which you could use with Warp Image with Projection Mesh. 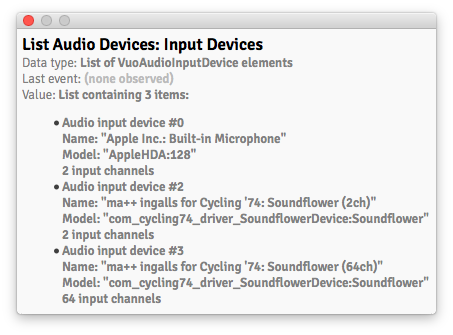 When you pick a device from Receive Live Audio's input editor, it matches based on the device model. However, both the 2- and 64-channel Soundflower devices have the same model number, so that will always choose the 2-channel version since it's listed first. Since the models are the same but the names are unique, you can use Make Audio Input from Name to pick the 64-channel device. Example attached (64channel.vuo). 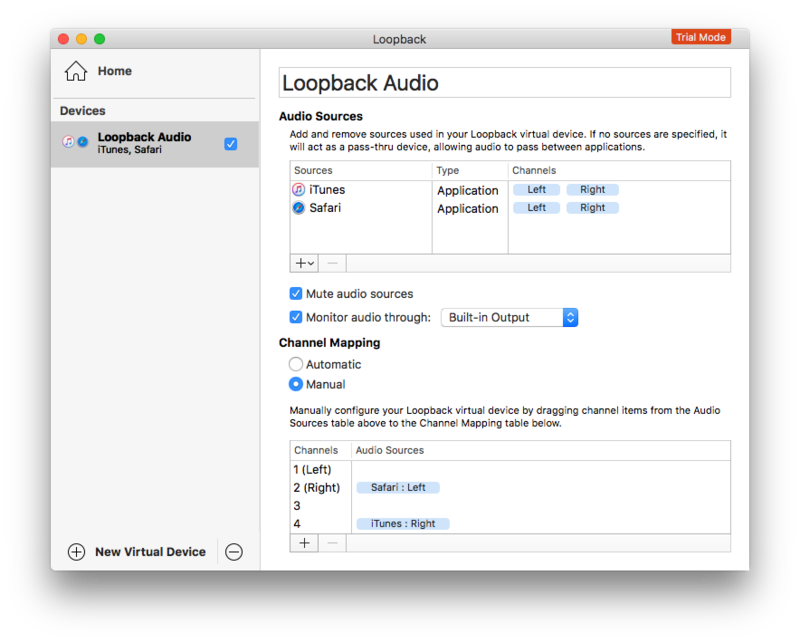 We installed and tested Loopback (in "true virtual mode", using audio from iTunes), and Vuo is successfully receiving audio data from it for us. mic, I don't think you did anything wrong. I'm seeing the same problem. Created bug report: API documentation says you can library file extension is optional, but it's actually required. On ARToolkit node github repository, mic reported that adding the library libAR.a to a module's dependencies as "dependencies" : [ "AR" ] doesn't work, but adding it as "dependencies" : [ "AR.a" ] does. This contradicts the documentation, which says that either should work. For some libraries (those within Vuo.framework? ), both options do work. Team Vuo should either allow both options for all libraries or fix the documentation. Thanks Jaymie. What I was doing wrong: I was plugging the layer into the "Layers" port on the Render node, rather than individual layer number.